Tapering – Mistakes to Avoid and Nutrition | So What? I run. 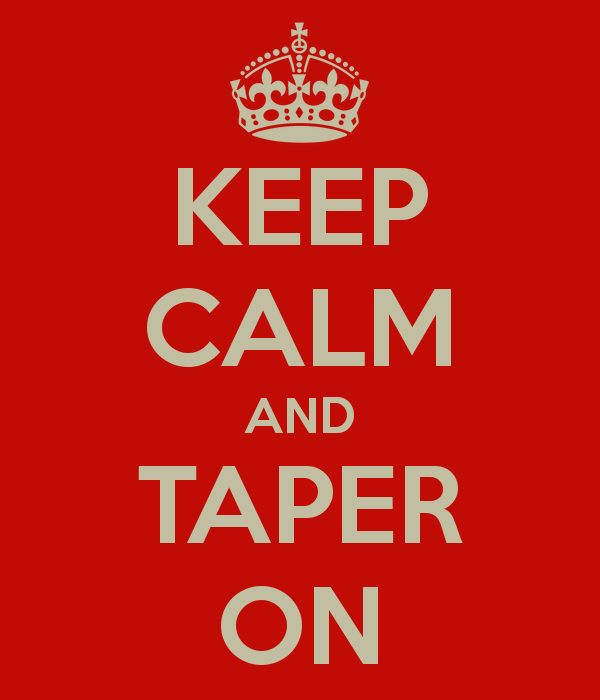 Tapering can be a challenge. Your body is craving carbs and you notice that you’re starting to pick up a pound or two. All of the sudden you notice every little twinge, ache, and pull in your muscles and it makes you panic. You feel the need to run more, when you shouldn’t. Then you feel the pressure of performing on race day and start having mini-panic attacks. Don’t worry, you are not alone. I can feel every fiber of my body doing something wonky and for some reason out of no where, I get this rush of panic and my heart palpitates and I’m thinking to myself what the heck is going on?! Here is an excerpt from Runners Connect about Nutrition. If you usually have toast with peanut butter in the morning, replace your peanut butter with a natural, all-fruit jelly or cut up fresh fruit. If you typically enjoy a wrap, soup, or salad for lunch, go with a full sandwich on a whole grain bread. For dinner, use a tomato sauce over your whole wheat pasta instead of a creamy cheese sauce over white pasta, or try an extra large sweet potato and cinnamon over a smaller white potato with butter. While tapering, choose higher complex carbohydrate foods when you typically eat a meal instead of adding extra calories during the day. Even though carbohydrates are the focus during tapering, protein can’t be forgotten. Protein is a dynamic part of the healing and preparation process of the muscles for race day. While the information above was not new to me, I did like the hints for swapping out foods. I have been slacking in this department. I typically have a high protein diet, but for some reason, this week it’s carbs, carbs, carbs! I also found “4 Marathon Taping Mistakes” in Runner’s World Magazine by Jenny Hadfield. All good stuff. I wonder if taper will ever come natural to me or if I will always have to remind myself what I need to do. What have you found to be the most important part of taper in your training? This entry was posted in Marathon Training and tagged Carbohydrate, Long run and short run, Marathon Running, marine corps marathon training, Nutrition, taper, tapering, Training by SoWhatIRun. Bookmark the permalink.